The median income in Kensington and Chelsea is now £101,600, the highest in the country; this is still not enough to buy a home at the average cost of £1,178,000. However the mean average income is £36,000, and one-third of all workers, the majority in North Kensington earn below £20,000. Cross King’s Road in this area and you go from the best to the worst income in London. 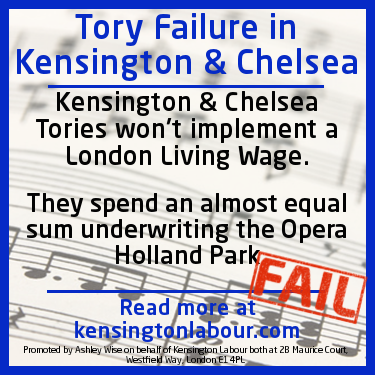 The Council has refused to pay its own low-paid workers London Living Wage of £8.80, or to insist its contractors pay the same, stating it would cost £1m; this is nearly equal to the sum the Council underwrites for the losses of running Opera Holland Park.